Our assortment of specialty, gun-cleaning accessories helps you always have the right tool for a wide variety of dirty jobs. Keep your firearms clean and functioning properly by removing even the tiniest pieces of gunk, grime, dirt and debris. Use this to illuminate the bore of your firearm and verify cleanliness. Place small end of bore checker in chamber of firearm using a light source above it. Look through barrel from muzzle end to determine condition of barrel. Then clean and oil firearm as needed. This assortment of cleaning picks easily removes small pieces of dirt and debris from hard to reach places such as the tight corners of actions and receivers. Also included is a universal double-ended brush for various cleaning chores. 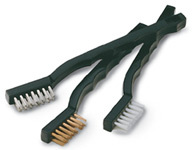 This 3-piece set brushes can handle virtually any cleaning job–There's a nylon brush for delicate and engraved parts, a phosphor bronze brush for aggressive cleaning of blued steel, and a stainless steel brush for the heavy jobs, such as the breech/bolt area.